Its been awhile since I reviewed a green kids book… though we certainly haven’t stopped reading. This particular book I stumbled upon at the library. I was rushing through to pick up some of my reserved books and saw the cover on display. I could tell it was about kids and nature so it only took 2.5 seconds to scoop it up and check it out. It is a mix of The Secret Garden and Johnny Appleseed with the modern twist of a child greening desolate urban areas. 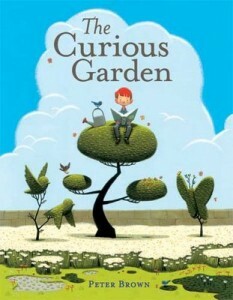 The book is The Curious Garden by Peter Brown. 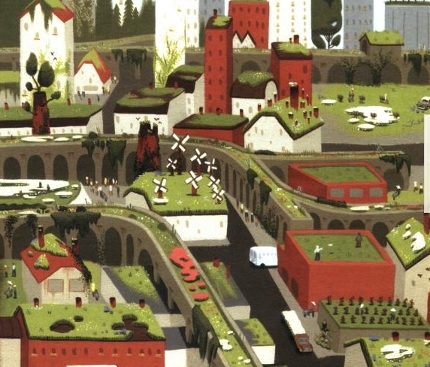 It tells the story of a little boy named Liam who lives in a very urban, factory town where little to no greenery exists. The opening visual is of a dreary looking city with large smokestacks, an abandoned railroad bridge, lots of abandoned buildings, and badly maintained homes and skyscrapers. Everyone stays indoors except Liam who likes to explore outside. One day when he is exploring he is run under the railroad bridge by rain and he discovers a door with stairs that goes up to the tracks. There among the broken tracks he sees a spot where a little moss and a small tree are growing and he falls in love with this tiny little garden. Liam becomes the city “gardener” and helps this little spot to grow. During the long hard winter he makes plans and he prepares to welcome his greenery back. Well long story short he helps the garden grow so that it takes off like crazy and when the other city folk see how beautiful it is they all start gardening and the city ends up with rooftop gardens, planter boxes on their skyscraper windows, trees, bushes, and the old and forgotten buildings and abandoned vehicles are overrun by greenery. The most lovely feature is the railroad bridge. Since there is no train, the bridge is a green belt of gorgeousness that weaves it way through the whole city. My kids (4, 6) and I loved the story and the pictures. Of course I thought it was a bit unrealistic that the smokes stacks were allowed to be overrun with greenery. Do these people not have to work anymore? LOL. It is nice idea but that bit of fantasy didn’t seem right to me somehow. I love the idea of greening our most urban and economically depressed areas but greening the landscape does not mean industry goes away. That is my only criticism though. I highly recommend this book for you and your kiddos! Great story, great pictures, and a great message.